RBS After seven years and several agonising near misses, England went into this year's RBS 6 Nations Championship knowing that this could be the season to secure their first Grand Slam under coach Clive Woodward. Having swept past New Zealand, Australia and South Africa in the autumn anticipation was high. The big hurdle was France, but once they were beaten at Twickenham in the opening match, expectations were raised. Wales, Italy and Scotland were defeated setting up a titanic winner-takes-all showdown with Irelan at Lansdowne Road. Two years ago the Irish had upset England's dreams but this time there was to be no mistake. 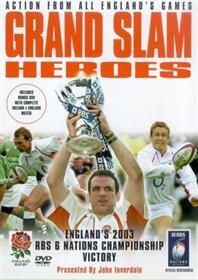 Revenge was sweet, as Martin Johnson led his men to success in a never to be forgotten victory in Ireland's back yard.Presented by the BBC's John Inverdale this historic DVD captures all the drama of this wonerful Grand Slam with highlights of every England game including the victorious match at Lansdown Road. Maintain your own collection with My Movies on Windows, Mac OS X, iPhone, iPad or Android. Click here.1106 titles in the collection.